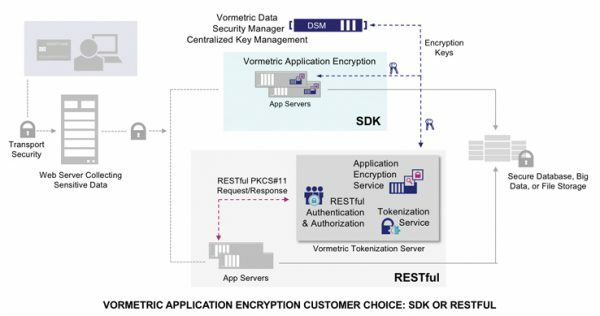 Streamline Encryption ImplementationsVormetric Application Encryption simplifies the process of adding key management and encryption to applications. Developers use RESTful API’s, Java, .NET, or C libraries to implement PKCS#11 standards-based solutions. Secure Cloud and Big Data EnvironmentsWith the application encryption solution, you can encrypt specific fields at the application layer, securing sensitive data before it is stored in database, big data, or cloud environments. Establish Strong ControlsWith keys under your control, can have the power to stop compromised DBAs, cloud administrators, hackers, and authorities with subpoenas from gaining unauthorized access to valuable data. Centralized Key and Policy ManagementVormetric Application Encryption enables centralized key management and control of application-layer encryption. Secure key generation and storage is provided by the Vormetric Data Security Manager. The solution simplifies the data security operations environment, reducing the number of management consoles that administrators have to learn and maintain. Flexible Implementation OptionsVormetric Application Encryption is available using two programming options: via an installable software development kit (SDK) and run time environment, available for a wide range of operating systems and programming language bindings, and via RESTful API’s. Both options provide access to key management, encryption, signing and other classes of API’s as defined by PKCS#11. Fine-Grained AuthorizationSolution architectures utilizing RESTful API access to Vormetric Application Encryption gain access to fine-grained authorization for access and use of encryption keys.